This issue, devoted to sight and sound in Whitman, Whitman Studies, and modern American culture generally presents a range of work related to the ways in which Whitman has been seen and heard over the course of two centuries in the U.S.
Whitman’s house on what was Mickle Street (now Martin Luther King, Jr., Blvd) in Camden was a place where sights and sounds collided for Whitman, as he would look out his first-floor window and watch the flow of goods and people going down to and coming back from the seaport. Later, not long after Whitman’s death, RCA built its headquarters just a few blocks from Whitman’s house, and Camden thus became the capital of sound recording and of the manufacture of sound recording technology. Some years later, in 1933, Camden became the first city in the country to have a drive-in movie theatre, synchronizing images and sound. The screen tower of the first drive-in at Camden, New Jersey, June 1933. 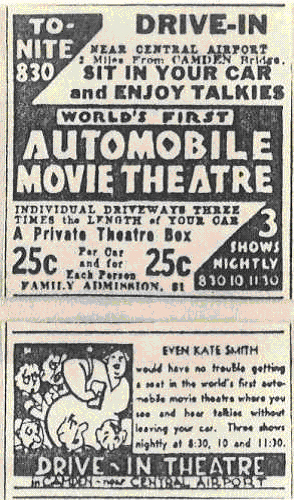 Screen of the first drive-in. Photo from Tim Thompson's Drive-In Theater.com. In this special issue we make available for the first time a wide range of spoken word LPs featuring actors reading from Leaves of Grass and educational videos about aspects of Whitman’s life and writings. It is hoped that this archive will be useful to both scholars and teachers of Whitman at all levels who are interested in issues of performance and interpretation. In keeping with this multimedia and hypermedia emphasis, the articles, feature pieces, poetry, and reviews published here address in various ways Whitman’s performance modalities and the sites, many of which splice together sight and sound, in which performances of his work took and take place. Ed Whitley contributes an article reflecting on his work on the website The Vault at Pfaff’s: An Archive of Art and Literature by New York City’s Nineteenth-Century Bohemians. Elizabeth Lorang discusses the issues surrounding the editing of Whitman’s journalistic poetry for the publicly accessible Walt Whitman Archive. John Tessitore takes up the issue of the Boston banning of the 1860 edition of Leaves of Grass and Whitman’s connection to Free Religion, putting into a more thorough historical context how Whitman was seen and heard by various factions in Boston during those years. Zoe Trodd, who, like Whitley, places Whitman in the milieu of nineteenth-century bohemianism, takes care to place him in a longer tradition of American protest literature, finding that while “Whitman had sensed earlier voices,” responding to them in his work, others after Whitman “listened back to Whitman’s voice.” She points out that Whitman is read into and read aloud at the scene of political protests, especially those revolving around the gay rights movement. Jason Stacy analyzes Whitman’s attempts to negotiate early consumerism while maintaining the ideals of artisan republicanism and Hicksite Quakerism in his exploration of labor and the nascent consumer economy, locating in his early journalistic performances a carefully crafted sounding of public politics. We also offer here, in the Documents section, Jesse Merandy’s hypertext of “Crossing Brooklyn Ferry,” a poem that is itself about the links made between and among people transhistorically. The poems of Judith Baumel, Adam Bradford, and Kim Roberts also help to situate Whitman in the larger American scene, both during his life and in death. Finally, our two crack reviewers—Roberta Tarbell and William Pannapacker—weigh in on Ruth Bohan’s book on Whitman and visual art and Kenneth M. Price’s investigation of Whitman and popular culture, respectively.